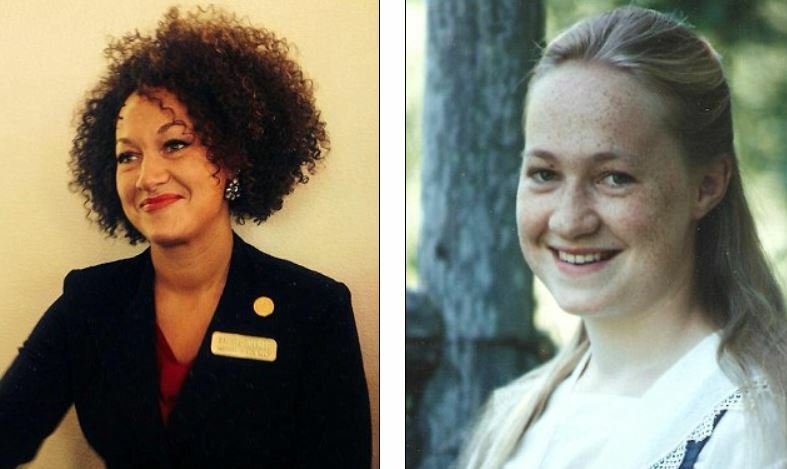 You will remember Rachel Dolezal, the woman who pretended to be black and became the NAACP Spokane, WA chapter president who was outed by her parents as being white. Honestly, who cares what color you identify with, the issue here is falsifying documents saying your one thing when you are another and actually feeling the need to make oneself look black to fit into the NAACP. In her case, does that mean black and white lives matter? Rachel Dolezal, the former professor and NAACP president who pretended for years to be black, finally admitted that she is actually a white person. During an appearance on the daytime television show The Real, Dolezal came clean and admitted what everyone else had known for months: she is a white person who was born to two other white people. Rachel Dolezal, the woman who faked her racial identity, has resigned as the president of the NAACP Spokane chapter. Rachel Dolezal portrayed herself as a black woman; however, she was outed by her parents as being white. Much of her past was made up. Her estranged parents told reporters last week that she is “Caucasian by birth,” with Czech, Swedish, German and a trace of Native American ancestry, even though she has been representing herself as black for years. The revelation that the Spokane NAACP chapter president was in fact white only had one conclusion. THIS WAS IT. You pretty much knew the handwriting was on the wall when Dolezal was scheduled to address the matter at a chapter meeting on Monday night, but the meeting was postponed. So how much of this resignation was internal pressure? They can say all the right things externally, but as one can plainly see from the VIDEO below, there were some if not many who were openly upset that a white woman dare pass herself off as black. 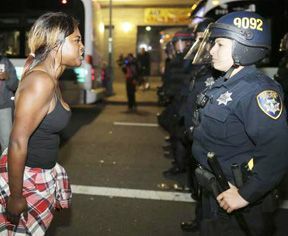 The activists stated, “I am sorry, you may not copy ‘MY’ people’s struggle.” So why is it being reported that she faked her racial identity, rather than she feels like she is a black woman? Hmm, isn’t that bigoted? It is a true honor to serve in the racial and social justice movement here in Spokane and across the nation. Many issues face us now that drive at the theme of urgency. Police brutality, biased curriculum in schools, economic disenfranchisement, health inequities, and a lack of pro-justice political representation are among the concerns at the forefront of the current administration of the Spokane NAACP. And yet, the dialogue has unexpectedly shifted internationally to my personal identity in the context of defining race and ethnicity. It is with complete allegiance to the cause of racial and social justice and the NAACP that I step aside from the Presidency and pass the baton to my Vice President, Naima Quarles-Burnley. It is my hope that by securing a beautiful office for the organization in the heart of downtown, bringing the local branch into financial compliance, catalyzing committees to do strategic work in the five Game Changer issues, launching community forums, putting the membership on a fast climb, and helping many individuals find the legal, financial and practical support needed to fight race-based discrimination, I have positioned the Spokane NAACP to buttress this transition. UPDATE I: NAACP Statement on the Resignation of Rachel Dolezal. HMM, JUST CURIOUS … IF ITS OKAY FOR BRUCE CAITLYN JENNER TO GO FROM A GUY TO A GIRL BECAUSE HE SHE FEELS LIKE ONE, WHY IS IT NOT OKAY FOR A WOMAN TO GO FROM WHITE TO BLACK? Wouldn’t that be something if Rachel Dolezal, Washington states most prominent civil rights activist and president of the Spokane NAACP was white? So says Rachel Dolezal’s parents who have outed their daughter as being white. Her biological parents claim she is misrepresenting “major portions of her life,” including being born white. Her parents say that their daughter “is primarily German and Czech and of European descent.” Dolezal dismisses the controversy as little more than an ugly byproduct of family dysfunction. This gives playing the race card a whole new meaning. Controversy is swirling around one of the Inland Northwest’s most prominent civil rights activists, with family members of Rachel Dolezal saying the local leader of the NAACP has been falsely portraying herself as black for years. Dolezal, 37, avoided answering questions directly about her race and ethnicity Thursday, saying, “I feel like I owe my executive committee a conversation” before engaging in a broader discussion with the community about what she described as a “multi-layered” issue. Dolezal is credited with re-energizing the Spokane chapter of the NAACP. She also serves as chairwoman of the city’s Office of Police Ombudsman Commission, where she identified herself as white, black and American Indian in her application for the volunteer appointment, and previously was education director for the Human Rights Education Institute in Coeur d’Alene. In recent days, questions have arisen about her background and her numerous complaints to police of harassment. Members of her family are challenging her very identity, saying she has misrepresented major portions of her life. Interesting. Of course there are some legal issues of knowingly falsifying your race on job applications, especially if they are government ones. However, the real test will come if it is determined to be true that she is white and not bi-racial as Rachel Dolezal claims. Will the NAACP do the racist and bigoted thing and fire her from being president of their Spokane, WA chapter? Does one have to be black to be an NAACP president? Wouldn’t that be racist and against federal laws of job discrimination? James Wilburn, former president of the Spokane NAACP chapter said that Dolezal’s race was not what had qualified her for the position in the organization. Really, we shall see. City’s NAACP leader accused of falsifying race. Her parents, Ruthanne and Larry, live in a rural home in Troy, Montana. Her father described a young Dolezal as blonde, blue-eyed and freckled-face. “No way to get around it,” he said. The couple say their daughter is pretending to be someone she’s not. “Rachel has wanted to be somebody she’s not. She’s chosen not to just be herself but to represent herself as an African-American woman or a biracial person,” Ruthanne said. A serious question has to be asked … if Bruce Jenner can become Caitlyn Jenner and celebrated as some cause celeb because he feels like he is really a woman, why can’t Rachel Dolezal make the claim she is a black woman trapped in a white woman’s body? Seriously, what’s the difference? If a man can think he is a woman because he feels so, why can’t a white woman be a black one, or vice-versa? Sorry, but the LGBT opened Pandora’s Box. In the end, Eric Holder’s Department of Justice will not file civil rights charges against George Zimmerman. The Department of Justice will not be filing charges against George Zimmerman in the shooting death of Trayvon Martin. Try as they might to to charge Zimmerman in this politically motivated sham of a DOJ investigation, it turns out they had nothing. Zimmerman was originally charged with the first degree murder of Trayvon Martin as many irresponsible individuals stated it was racially motivated and a hate crime. The “white” Hispanic killed a black teen. Even though the feds had intimated that there would be no charges filed, federal officials have insisted their civil-rights probe would be thorough and complete as it went on for nearly three years. After all is said and done, after the liberal MSM and Obama/Holder Justice Department tried to railroad Zimmerman, he walks away with an acquittal and no civil rights charges. That usually occurs when one kills another in a self defense shooting. As Legal Insurrection opined, “This decision comes as no surprise to anyone familiar with the actual facts of the case.” Imagine that Jesse Jackson, Al Sharpton, Barack Obama, Eric Holder, NBPP, NAACP and the rest of the race-baiters, George Zimmerman did not violate Trayvon Martin’s civil rights or kill him because of his color. Local prosecutors initially did not feel there was enough evidence to prosecute the case. They were replaced and a politically motivated prosecution was conducted to get their pound of flesh from George Zimmerman. The murder prosecution failed, not the federal investigation into civil rights charges against Zimmerman has failed. One has to wonder if a civil law suit is next? However, I would have to agree with Robert Zimmerman, a wrongful death trial, could be very troubling to the family of Trayvon Martin and could lead to very unpleasant facts that were never a part of the criminal trial. ABC News – Trayvon Martin: DOJ Announces No Charges Against George Zimmerman. Justice Department officials met with Martin’s family today, and were told that they will not be filing charges against George Zimmerman, who shot the 17-year-old after a confrontation in 2012. Thursday marks three years to the day since Martin was killed. 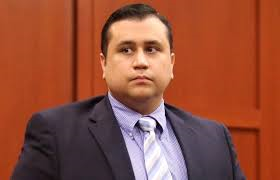 Federal prosecutors concluded there is not sufficient evidence to prove Zimmerman, a neighborhood watchman in Sanford, Fla., intentionally violated Martin’s civil rights. “Although the department has determined that this matter cannot be prosecuted federally, it is important to remember that this incident resulted in the tragic loss of a teenager’s life,” Acting Assistant Attorney General Vanita Gupta of the Civil Rights Division said. “Our decision not to pursue federal charges does not condone the shooting that resulted in the death of Trayvon Martin and is based solely on the high legal standard applicable to these cases.” The case sparked intense discussions over race in America because Martin was walking to his home with only Skittles and an iced tea in his hands. UPDATE I: Federal Officials Close Investigation Into Death of Trayvon Martin.